Nature is rife with symbiotic relationships, some of which take place out of sight, like the rich underground exchange of nutrients that occurs between trees and soil fungi. But what happens in the dark may have profound implications above ground, too: A major new study reveals that soil fungi could play a significant role in the ability of forests to adapt to environmental change. Kai Zhu, assistant professor of environmental studies at UC Santa Cruz, took a unique "big data" approach to investigating the role of symbiotic fungi in tree migration in forests across the eastern United States. "Our climate is rapidly changing, and our forests are responding, but in very slow motion–it's hardly detectable," said Zhu, who wanted to identify factors that contribute to the pace of that response. In forests, tree growth largely depends on the nutrients available in the soil, while the transfer of carbon through roots to the soil regulates ecosystem processes. Mycorrhizal ("MY-koe-RY-zull") fungi grow on the roots of most plants and drive the nutrient-carbon exchange between plants and soil: They take up carbon resources from their hosts and provide soil nutrients that plants need. The two most common fungi associated with forest trees are ectomycorrhizal (ECM), which grow on conifers, including pines, oaks, and beeches, and arbuscular (AM), which grow on most nonconifers, such as maples. 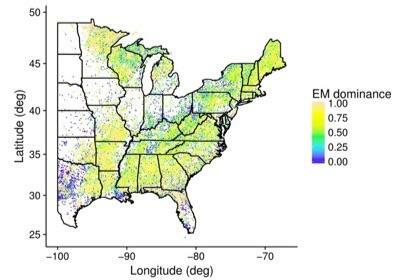 Zhu utilized data from the U.S. Department of Agriculture's Forest Inventory and Analysis program to examine how soil carbon and nitrogen levels differ across stands of forest that are characterized by "AM dominant" trees and "ECM dominant" trees. He correlated the distribution of trees with soil fungi and content, then analyzed the distribution of trees by fungus type. In the most significant finding, Zhu was able to identify distinct soil nitrogen "signatures" that impact soils and ecosystems in ways that may determine the resilience of forests to the changing climate. Specifically, soil carbon-to-nitrogen ratios increase with greater ECM dominance–even after accounting for climate, soil texture, and foliar nitrogen. Moreover, ECM dominance is more associated with low soil nitrogen rather than high soil carbon. "These findings suggest that AM and ECM trees have differential success along nitrogen fertility gradients, or perhaps that AM and ECM trees promote differences in cycling rates of carbon and nitrogen because of traits associated with nitrogen acquisition," he said. "Both processes may occur simultaneously, leading to a self-reinforcing positive plant-soil feedback." Zhu's findings suggest that the mycorrhizal guild could be an emerging "functional trait." Functional traits are those that define species in terms of their ecological roles–how they interact with the environment and with other species. As such, they are predictable and easily measured from the ground or by satellite, which makes them particularly valuable to scientists who are monitoring environmental responses to climate change. "They tell us how the ecosystem is responding," said Zhu. "There is no evidence yet that eastern forests are shifting their geographic ranges to higher latitudes in response to warming temperatures," said Zhu. "But understanding how mycorrhizal relationships impact ecosystems will help us predict how forests will respond to global change." Zhu's study, published in the Journal of Ecology, is one of the first to use the USDA's large-scale data set to see how climate change is impacting the ecosystem, an approach known as "top down" rather than "bottom up." As a quantitative environmental scientist, Zhu brings the tools of statistics and data science to the study of global ecology. Rather than measuring fungal traits in the soil and scaling up, Zhu uses existing data–including large-scale datasets generated by satellites–to look at patterns and processes playing out on continental and global scales. "Big data is becoming more and more popular and powerful," he said. "It's different from traditional research in ecology, which takes place in a lab or in the field." Zhu, whose background is in physics and systems theory, brings tremendous urgency to his work on climate change. His research focuses on four areas: forest ecosystems, grassland, soil, and phenology, which Zhu describes as "nature's calendar." Zhu is determined to make solid contributions to a field in which much of the evidence is incomplete and unconvincing. "We know the environment is changing, but how it impacts the Earth and its systems is a big question," he said. "As scientists, we have the responsibility to correctly work out this problem–it's a problem that's important to scientists and the general public."